Sri Chinmoy has been a poet from a young age. He began writing poetry whilst a teenager in the Sri Aurobindo Ashram. His poetry has always been a reflection and revelation of his own spiritual experiences. His early poetry express a range of emotions and feelings a spiritual aspirant passes through. In recent years his poetry has evolved its own unique style and is best suited as a guide and inspiration to the spiritual life of a seeker. 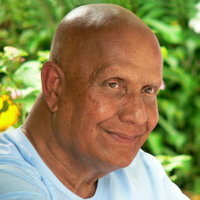 Sri Chinmoy was born in 1931 in India. At a young age he lost both parents and therefore moved to the Sri Aurobindo Ashram in Pondicherry. After 20 years in the ashram he followed an inner command to go to America to share the wisdom of yoga to seekers in the West. Since 1964 Sri Chinmoy has sought tirelessly to inspire others to lead better more fulfilling lives. As well as being a noted poet Sri Chinmoy is also a musician and has given several hundred free concerts of meditative music. Sri Chinmoy is also the founder of the Sri Chinmoy Oneness-Home Peace Run which seeks to spread greater world harmony and friendship through a relay run across the 5 major continents. There are over 350 Sri Chinmoy Centres in different parts of the world. Sri Chinmoy Poetry Festival – The Sri Chinmoy Poetry Festival is an exploration of life through poetry, music and art. It is held annually in August with the inaugural festival occurring in 2009.